Our second Halloween Horror podcast of 2011! If a trio of cinematic terrors wasn’t enough, check out our reviews of these frightening films that are all available for instant streaming (via the movie site that everyone loves to hate) right now! This October 31st, don’t forget to celebrate All Hallows Read! The idea behind this new holiday is quite simple. Give a scary book to someone. A friend. A relative. A stranger. Help spread the love for scary books. For the first annual All Hallows Eve, there’s not a book we could more highly recommend than Echoes. Written by Joshua Hale Fialkov, with art by Rahsan Ekedal, Echoes tells the story of Brian Cohn, a man learning to deal with the schizophrenia he inherited from his father. With a supportive wife, a new baby on the way, and drugs to silence the voices in his head, Brian seems to be in control. But, when at his father’s deathbed, he learns that he also inherited the trophies of his father’s career as a serial killer, his illness threatens to send him further down the path to madness. 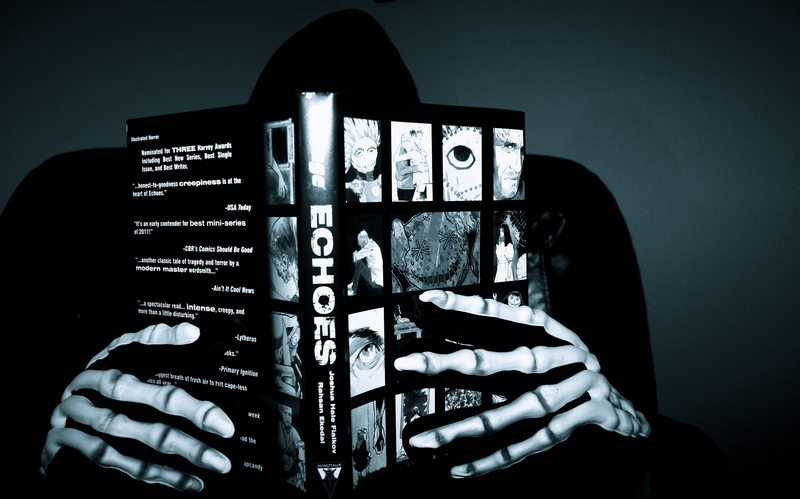 Echoes is creepy, atmospheric, and a serious page turner. Give the gift of terror this Halloween! Go to allhallowsread.com for more spooktactacular book recommendations.